Even more interesting Sonic Australian items! This page will, as usual, contain a mix of new and old things. Some of the new things here may be currently obtainable, so be on the look-out if you want them! The link block at the left side can contain links to places which sell them. (It changes, though) Where possible, a link will be provided in the description, while the item is being sold. Caution: Some things may only be able to be obtained while you are within Australia. The new/old status of the item will be noted in it's description. This is a bonus gift item. 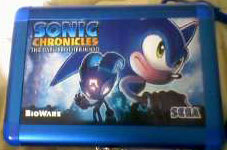 This aluminum box is the Pre-Order gift for if you get Sonic Chronicals: The Dark Brotherhood in Australia. The box is aluminum, with what looks like powdercoat blue paint, and an image of the box-art on the front. The side has a lock, and it also has a strap. 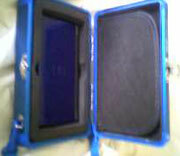 Inside, you can see a padded area for your Nintendo DS, and 3 pockets to keep your games. Really, an actual metal case is quite a nice pre order prize! 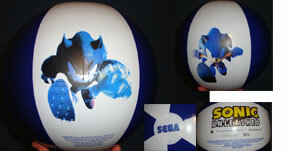 This will be available only during the release of Sonic Chronicals game, so it could become somewhat rare. Photos, ad, and info provided by: Flare. While the USA (and possibly elsewhere) got a set of 3 styluses for pre-ordering, Australia gets this handy metal DS case. 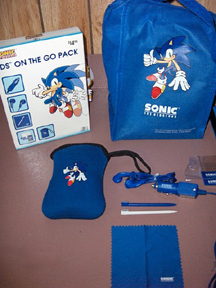 Here's a Sonic X party supplies pack. This is the first real new Sonic party supply. In the USA paper supplies such as these are in great demand, even though they havn't been made since the 1990s. As you can tell, this set is Sonic X themed. It has 40 items inside, which will serve 8 people. They include 8 plates 7", 8 cups, 8 napkins, 8 invitations and 8 loot bags. When first appearing, it cost 15 Australia dollars. Want some? You need to go to Party Direct Australia. They do take US Dollars, but where do they ship to? Here's a cool promotional bag that shows that Japan isn't the only place to create fancy bags. This promo bag is from EB Games of Australia. 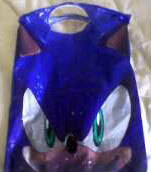 If you bought any game around the time of the release of Sonic the Hedgehog 360, it would be placed into a bag like this. 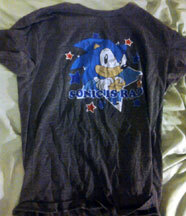 The front has a huge all-over Sonic face, which makes for a neat design. 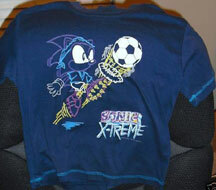 The back has the 15th anniversary symbol, the logo for Sonic and also Sonic Rivals. This is a rather cool collectible bag. Photographed and owned by Flare. If you pre-order Sonic Unleashed/Sonic World Adventure from an EB Games in Australia, you'll get this Werehog figure for free! If you look closely, you can see that it might even be articulated in the arms. Once the real figure is aquired, it will be added in near this ad. Ad discovered by Flare. Here's a pin by Aminco Pins. They were known for producing Olympic Games related pins in Australia. This pin is just a regular little stock-art Sonic with arms crossed. 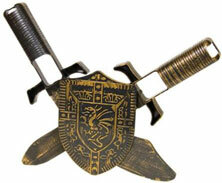 They've done a good interperatation of it in enamel and metal. 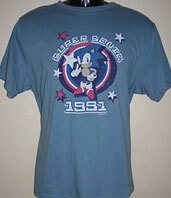 It's from 1997, which makes sense, as this was still the 'classic Sonic' era. Pin photo discovered by Frizo. 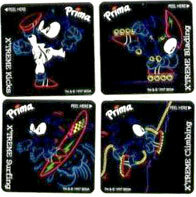 Here is a collection of 4 Sonic stickers from Prima Juice. Prima makes 25% fruit juice boxes and pops in Australia. 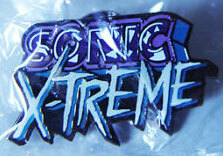 The stickers use a rather unique style, which appeared around when Sonic Xtreme (the game that was never released) was getting a lot of buzz. You'll recognize the 'karate' one from other items. It is interesting to see that it was a part of a series, including rollerblading, surfing, and mountain climbing (all things likely considere 'xtreme' activities) The art has only colored lines on black, apart from Sonic's eyes. Each of these shirts is from a store called Jay Jays on the "Old Faves" line. 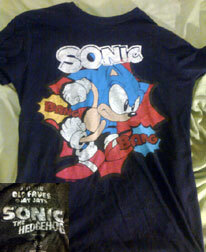 The line features Sonic in classic style (with fake wear to the designs) as well as other video game characters who appeared in the 1990s. There may be 5 other shirts available. 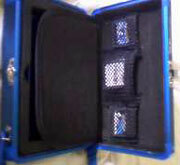 This is a cool kit of accessories for your DSi. Look at this great bonus set! 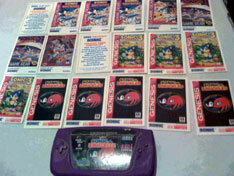 If you bought the Sonic Classic Collection for the Nintendo DS in Australia, you could get this whole set of extras as a free bonus with the game. 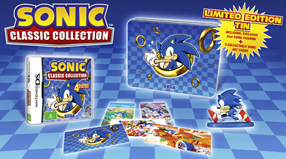 It comes in a 'limited edition tin' (metal box) with 5 collectible 'art cards' and a mini Sonic figurine. The figure is solid plastic and features classic running Sonic on a little base. It looks A LOT like the First4Figures one, only it is much smaller. Could they have shared their sculpt? It's also been thought to come with a ring of some type. Discovered by Spanishpuzzle.